One of the most popular and most in-demand home renovations is by far the kitchen. Because kitchens see the most wear and tear of any room in your house, and because they tend to follow style trends, kitchens can seem the most dated sooner than other areas of your home. If you plan to sell your home anytime in the future, most buyers expect a modern kitchen with nice cabinets and a cook-top stove, so renovating your kitchen will only increase the value of your home. Plus you’ll get to enjoy a new, updated space. 1. Ask yourself how you are you really going to live in the space. The livability factor will determine where you should save and where you should splurge. For example, if you enjoy cooking, you may want to splurge on appliances. If the kitchen is the central gathering room in your home, you’ll want to make sure you have lots of space for seating. 2. 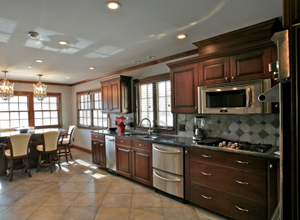 Establish priorities for a kitchen remodel. Spend at least six months planning your kitchen renovation project. A professional designer can simplify your kitchen remodel by helping to make style decisions and foresee potential problems. Do your research and compare prices on all appliances, cabinet, counter-top and other purchases. 3. Add storage not space. Adding a room or even a small bump-out to increase the size of your kitchen will be costly and complicated (think permits, foundation work, framing and so on.) You can add storage without tearing out walls by installing cabinets that reach the ceiling and mounting shelving units on unused wall areas and inside cabinet doors. 4. Splurge on cabinets and flooring. Opt for solid wood cabinet faces and full plywood box construction. Also, look for drawers that have dovetail joinery and bulky mechanical slides. For flooring Porcelain tile, natural stone surface or Hardwood. 5. High-end appliances aren’t always better. It’s a fact that a $10,000 stove will not boil water faster than a $500 stove, however an industrial stove will often give you additional burners, beefier construction and the look most folks desire in a high-end kitchen renovation. But if you don’t cook a lot, a high-end stove will be a waste of money. Choose upgrades on appliances based on your personal preferences and how you plan to use them. 6. Stone surfaces are nice, but require upkeep. Most high-end kitchen renovations include a stone counter-top surface — generally granite is the best choice in terms of durability, price and upkeep. Marble and soap stone require constant maintenance and can chip very easily. And don’t underestimate Formica — it’s cheap and easy to clean. For more information on renovations in Winston-Salem, contact us!